Maria Bechara in Blood Wedding. Photo by Nataly Hindaoui. Maria Bechara as the Bride with cast members from Blood Wedding performing a scene in the backyard garden of a Hammana home. Photo by Nataly Hindaoui. 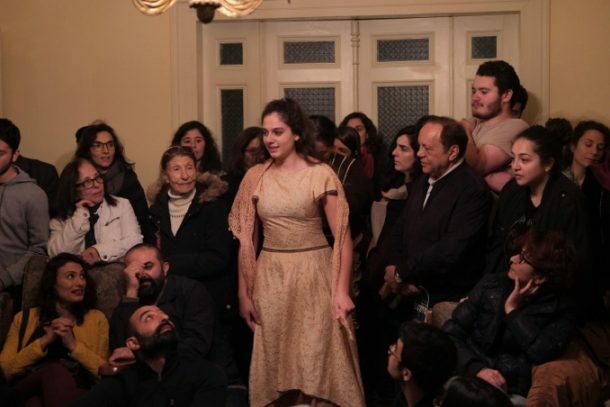 In April, the Theatre Initiative at the American University of Beirut and Hammana Artist House presented an original promenade performance of a new Arabic translation of Federico Garcia Lorca’s Blood Wedding translated and directed by Lebanese theatre director Sahar Assaf and produced by Robert Meyers of AUB. The production, which incorporated music in both Arabic and Spanish, took place throughout the small village of Hammana in private residences, churches, theatres and in the street. Utilizing the help from performers and a robust creative team which included students and faculty at AUB, in collaboration with residents of the village, audience members were divided into two groups and brought to separate locations for the first two scenes, and finally reunited at the end of act one to experience the conclusion of the performance together. Blood Wedding both began and concluded at the Hammana Artist House, a brand new multidisciplinary art residency space with a focus on the performing arts, which offers local and international artists to develop and deepen performance practice and research. The show provided audiences an intimate introduction to the village of Hammana by bringing them both through private residences including homes and apartments, in addition to community gathering spaces such as streets, churches and a movie theatre. The entire village was the stage for this dynamic, immersive new adaptation, which included a cast of over 25 actors and singers from the Beirut theatre community. Hammana Artist House. 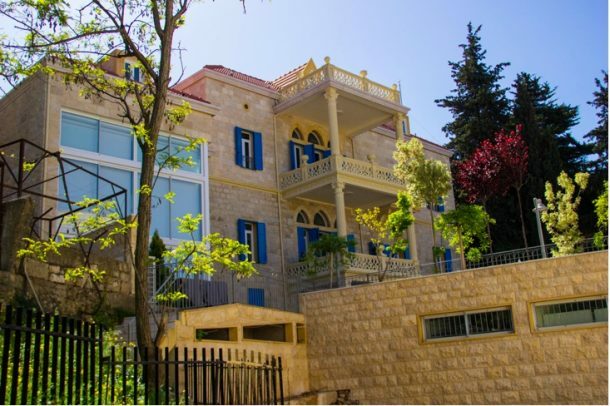 Located in the mountains 40 minutes away from Beirut, the Hammana Artist House is a multidisciplinary art residency space open to local and international artists (with a focus on performing arts). Founded in 2016, by Robert Eid in collaboration with Collectif Kahraba, the Hammana Artist House includes spaces for rehearsals, a black box theatre, open air theatre. The space also includes a living residence and multiple kitchens for artists in residence. Photo by Ashley Marinaccio. 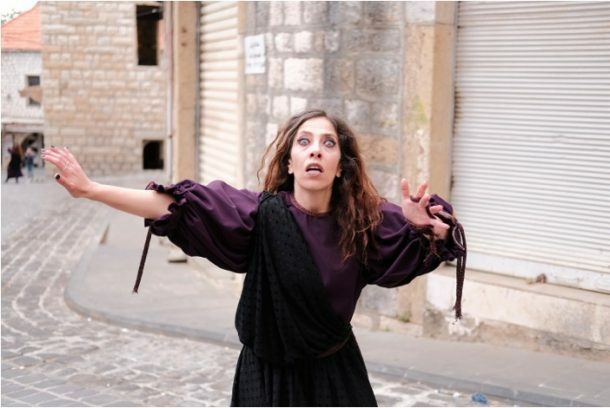 Rita Barotta as the Beggar, acts as a narrator and guide leading audiences throughout the town of Hammana through the streets, into homes and finally back to the Hammana Artist House. Photo by Nataly Hindaoui. Spectators pack the living room of a small house during a critical scene of Blood Wedding featuring Maria Bechara as the Bride (center). Photo by Nataly Hindaoui. 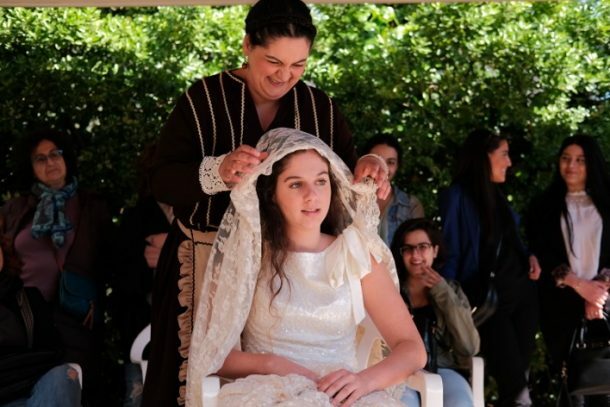 Both residents of Hammana and audience members were active participants in the events of the play as guests at the wedding, bystanders and sometimes Assaf adds, “One thing I enjoyed was that three little girls were always around during the performances. One night we saw one of the girls sneaking into the Roxy to watch a scene, and the next night she brought her friends with her. They came to me and asked ‘Can we watch? Can we please watch?’ And I was torn because the show was for ages 16 plus, but also I know that they haven’t had this exposure before.” The Hammana Artist House exists to help to expose and involve new communities in theatre and the arts. Blood Wedding is one of many productions and new play developments that Hammana Artist House will participate in over the year. Ashley “Ash” Marinaccio is a theatre artist and scholar who creates work to challenge the status quo. She is dedicated to documenting the socio-political issues that define our times. As a director and playwright, her work has been seen off-Broadway, at the White House, United Nations, TED conferences across the United States, Europe, and Asia. Currently, Ash is working on her Ph.D. in the Department of Theatre and Performance at the CUNY Graduate Center, where she is focusing on theatre and war. Ash is the founding Artistic Director of the theatre company and United Nations NGO Girl Be Heard, where she received numerous accolades, including LPTW’s Lucille Lortel Women’s Visionary Award. She is a co-founder/director of Co-Op Theatre East, member of the Civilians Field Research Team, and creator of the B.F.A. In…, a new web series. Ash is on the faculty at Pace University and Hunter College. Learn more: ashley-marinaccio.com.